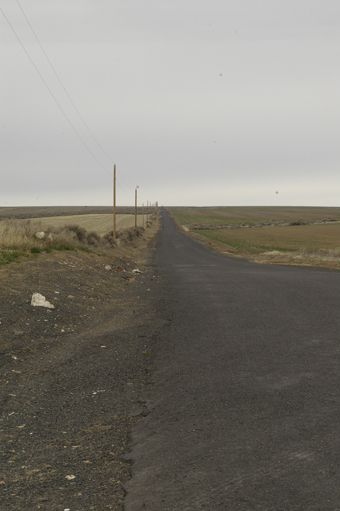 I will not say exactly where this Gravity Hill it is located, except that it is within ten miles of downtown Prosser. Gravity Hill is not easy to find. The landscape around Prosser has lots of rolling hills, and the government put in many, many roads in a square grid work, with a new road every mile. So one place looks a lot like the next. However you know you have found the place because someone spray-painted a line across the road, along with the helpful suggestion of “START.” Even with good directions, it took my friend Eric and I an hour to find it. Once we got there I drove to the start line, facing uphill, and put my foot on the brake. I looked forward. The road seemed to rise steadily to a small hillcrest about eight hundred feet away. I left the car engine on, just in case, but put the transmission in neutral, and then let off on the brake. Slowly, the car began to move forward without any power. Uphill! I brought a GPS unit along with me, and compared the elevation and speed it recorded with my car speedometer. According to both gauges, the car accelerated to a top speed of eleven miles per hour in about three hundred feet. It kept steady at that speed for about two hundred more feet, and then the road grade increased dramatically, as we climbed the small hill. We began to slow, but continued climbing up the hill for another three hundred or so feet. The car slowed down to about eight miles an hour, but kept going. In the last forty feet or so, the ground rose sharply, and the car slowed down even more. It may have been my excitement, but it seemed like the car was inching its way uphill. The hill rose about five feet in height in the last thirty feet of road before it crested. I looked at the gauges, and we had slowed to about five miles an hour. It seemed like were barely moving. I wanted to jump out and push, but it was not necessary. We finally crested the rise of the hill, and went down the other side as gravity increased our speed. Eric and I both yelled, we were so excited. I turned the car around to try again. As we drove back over the hill, I stopped the car on the steepest slope, just over the crest of the little hill. We were definitely on a downward angle. I put the transmission in neutral, and let off the brake. We did not move. We did not roll downhill, but we did not roll uphill either. It was as if we were suspended. I waited for several seconds, but we stayed where we were. Finally, I put the transmission back in gear and drove to the starting line. It worked the same way; stop, put the car in gear, let off on the brake, and coast uphill. 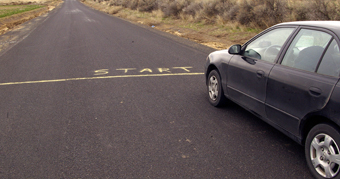 We did it several times, as we talked about theories of places like Prosser’s Gravity Hill. Gravity Hills have become urban legends, and perhaps the oldest story comes from a town in Texas, where a school bus was stuck on a railroad track. Before the children could get out of the bus, a train struck it, and all of the children were killed. Supposedly, if someone stops their car on the tracks, and puts their car in neutral, then the children will push the car off the tracks, and uphill for several yards. Some people have put talcum powder on their car bumpers, and claim that they even had children sized fingerprints smudging the powder. This did not seem to fit Prosser. There were no train tracks, or any school bus disaster. However, some Internet stories say that a woman drowned in a nearby irrigation ditch, and she pushes the car. The skeptic in me looked for a scientific explanation of how this could happen. There were a couple of theories of how a Gravity Hill could happen. One idea is that in many places across the world, there are hills or mountains with lots of iron ore in them. This iron can become magnetized, and will actually pull anything made out of metal uphill, to the center of the effect. Another theory holds that it is all an optical illusion. Skeptics suggest that this kind of effect can happen when the surrounding landscape tilts in one direction, and the road tilts in another. Because of the multiple angles, the human eye is fooled, and a road can look like it is going uphill, even though it is really going downhill. That be true in a number of cases, but it seems unlikely in Prosser. The GPS unit I brought along showed a steady increase in elevation as we traveled the road. The road did undulate a bit, with small dips and rises. Could this have been enough to keep the car going? I honestly do not know. It will take a few more trips and some experiments to figure this one out. 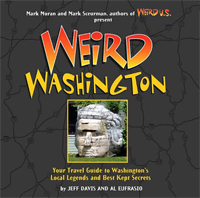 For anyone who wants to try, there are not many clues of where to find Washington’s Gravity Hill. Some people just drive all the roads, looking for the start sign. It took a while before I found someone who knew, and someone gave me directions. The price for the directions was that I do not repeat them here. After all, this chapter is Roads Less Traveled, and I think we should keep it that way. If you try to find Prosser’s Gravity Hill, good luck. If you do find it, please remember some common sense rules of courtesy. Even though it can be really spooky trying at night, and it would be a great way to have a roadside party with friends, please don’t. Some people drive too quickly on these country roads at night, and accidents can happen. There are also many farmsteads along these country roads, they go to bed early, and get up early too. Please be respectful of their privacy. After all, farmers carry guns to eliminate varmints.